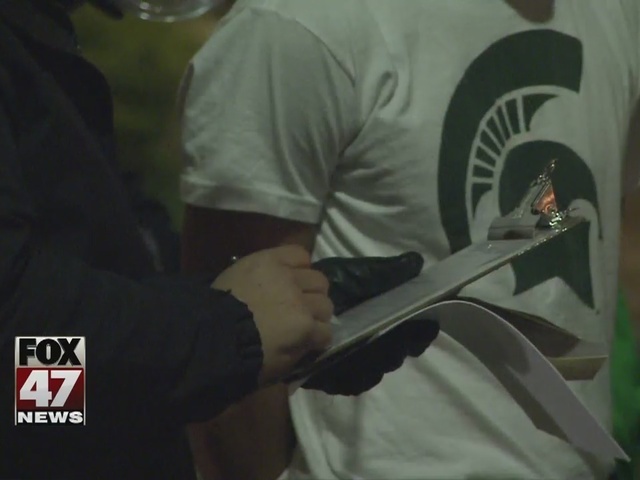 Spartan celebrations landed eight students in jail Saturday night. As soon as the game ended, thousands of students rushed Cedar Village, starting fires and even setting off fireworks in the middle of the street. But Sunday morning, things were much quieter in Cedar Village. It's hard to believe just hours earlier thousands of people were gathered there celebrating the Spartans' victory. "We win immediately just immediately first reaction everybody runs outside. It's running all the way from down there, it's everybody is chanting. And it goes on for what seemed like for hours," says MSU student Alyssa Edwards. The celebration took a turn once things were set on fire. East Lansing Police tell FOX 47 that there were thirteen fires reported. When asked why Cedar Village was the place students run to, students told us it's a long standing tradition in the city. "It's got history of everybody you know coming together and really appreciating Michigan State for what it is. And I think that's the name that stuck with it. That's how people come together," Edwards said. A tradition that runs in the family for Alexia Anagnostopoulos. "it's been happening since my dad was my age. He remembers coming up to visit his friends and everybody would riot after the games," said Anagnostopoulos. "It's just something everybody knows about. As a freshman you learn it really fast and as a upperclassman you keep it going." But it seems like MSU students are the only ones that enjoy to celebrate by lighting things up. It's a tradition Tammy Lemmer doesn't understand. "Well some traditions are good and some traditions are bad, and just because something has always been done, isn't a reason to continue that. Especially if it's dangerous or causes people or property harm," said Lemmer. Fortunately, East Lansing Police says there were no injuries.